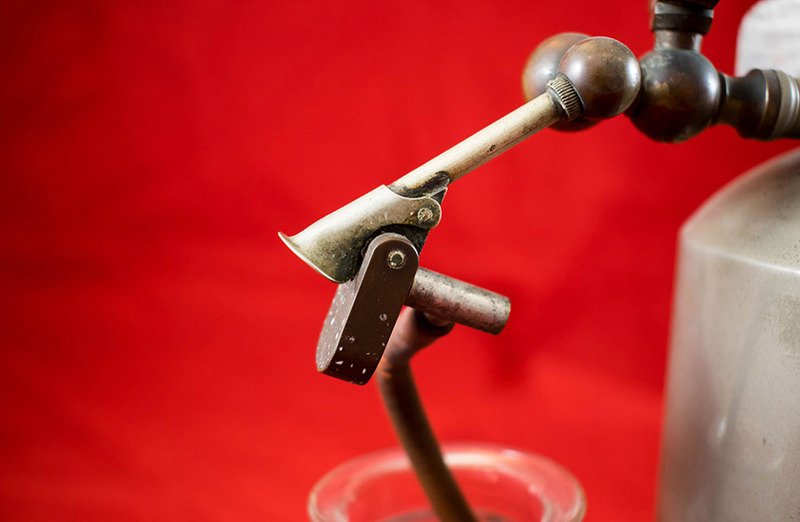 Lister (1826-1912) used a steam spray such as this one to spray the air in his operating theatre with carbolic acid. Sprays containing measures of carbolic acid were used in Lister's wards between the 1870s and the 1890s. The maker of this spray was David Marr of 27 Little Queen Street, London, who made many of Lister's instruments. The spray has a grey metal body with a wooden handle attached at one side and a container for the carbolic acid at the other side. Water was boiled in the upper container of the main part of the spray by a spirit lamp in the lower part. The steam produced was emitted across the tube leading into the container of carbolic acid whereupon the steam mixed with the acid. Implements used by Lister for spraying underwent a steady evolution. 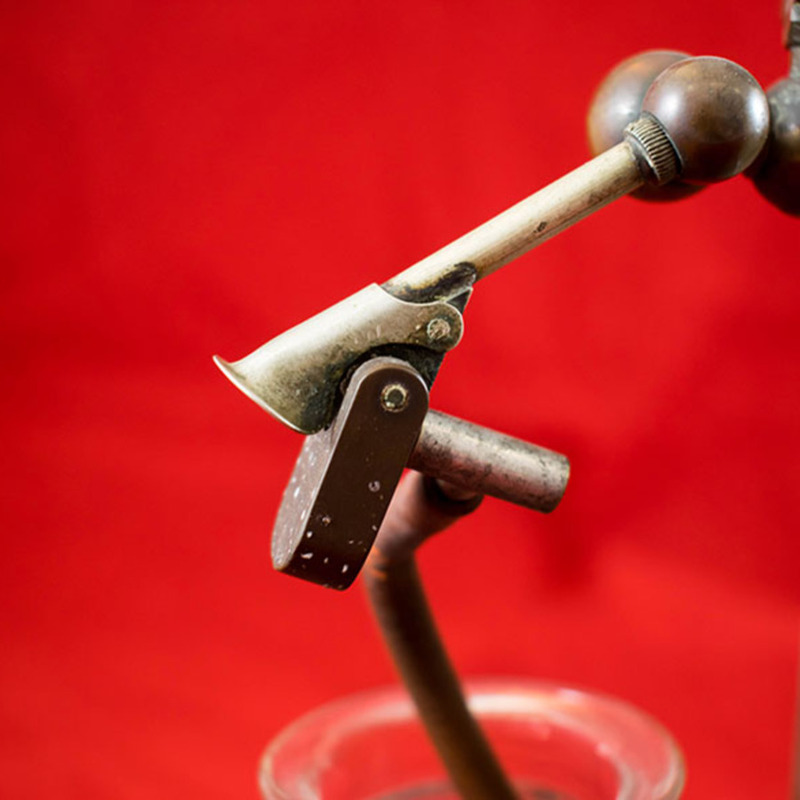 Originally an ordinary rubber bulb spray was used, this was then replaced by a large and more cumbersome machine which was mounted on a tripod and manipulated by a long pump handle. Stage three in the development process was the steam spray shown here. The carbolic acid solution used in the sprays also developed with time, the parts of acid becoming stronger. Lister was aware that the air was a medium for germs and his belief that germs could be destroyed by chemical substances was influenced by the work of Louis Pasteur. The use of the spraying technique employed by Lister was an important element of the antiseptic ritual of treatment. Lister's success with antiseptic procedures revolutionised the treatment of disease and injuries. The papers of Joseph Lister (RCPSG 11) are held in the College Archives. The College also holds a pocket case of lancets, bistouries, probes and hooks which belonged to Joseph Lister. In the Lister room within the College there is a table and a fireplace rescued from the Lister wards of the Glasgow Royal Infirmary when they were demolished in 1924. Lord Lister's graduation gown is also displayed in this room. The College's art collection includes an etching of Joseph Lister by Wilfred C. Applebey and a print of a portrait of him by T. Hamilton Crawford, as well as a picture of the scene of the demolition of the Lister wards. 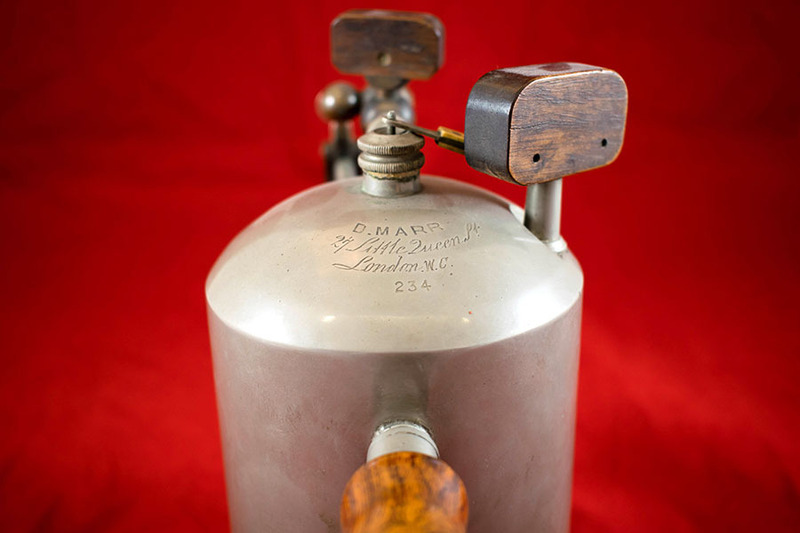 David Marr; 1878-; Surgical instrument maker, “Lister Carbolic Spray,” Heritage, accessed April 20, 2019, https://heritage.rcpsg.ac.uk/items/show/34. 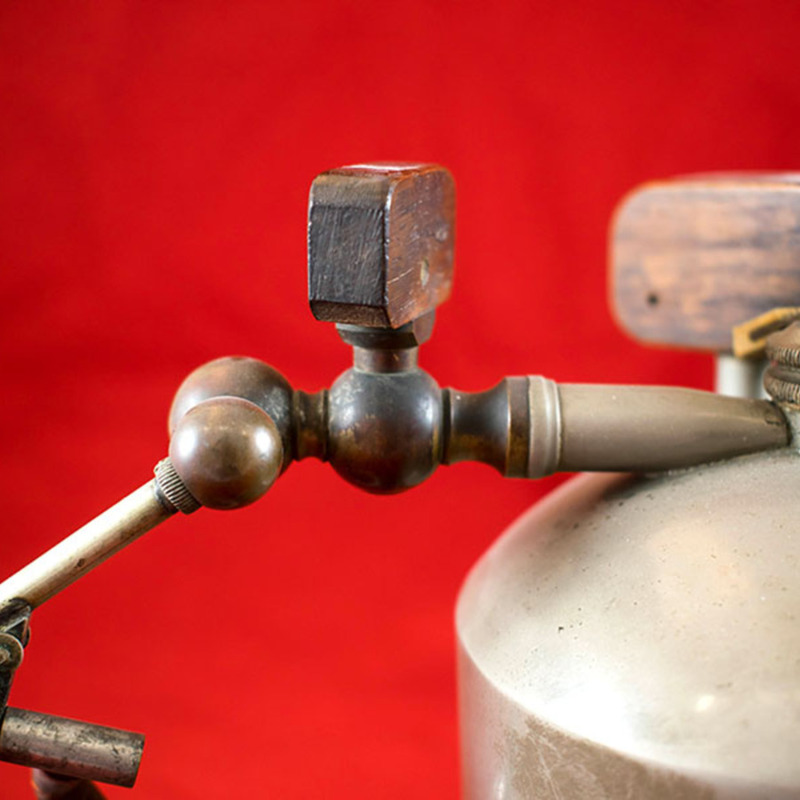 Description: Lister (1826-1912) used a steam spray such as this one to spray the air in his operating theatre with carbolic acid. 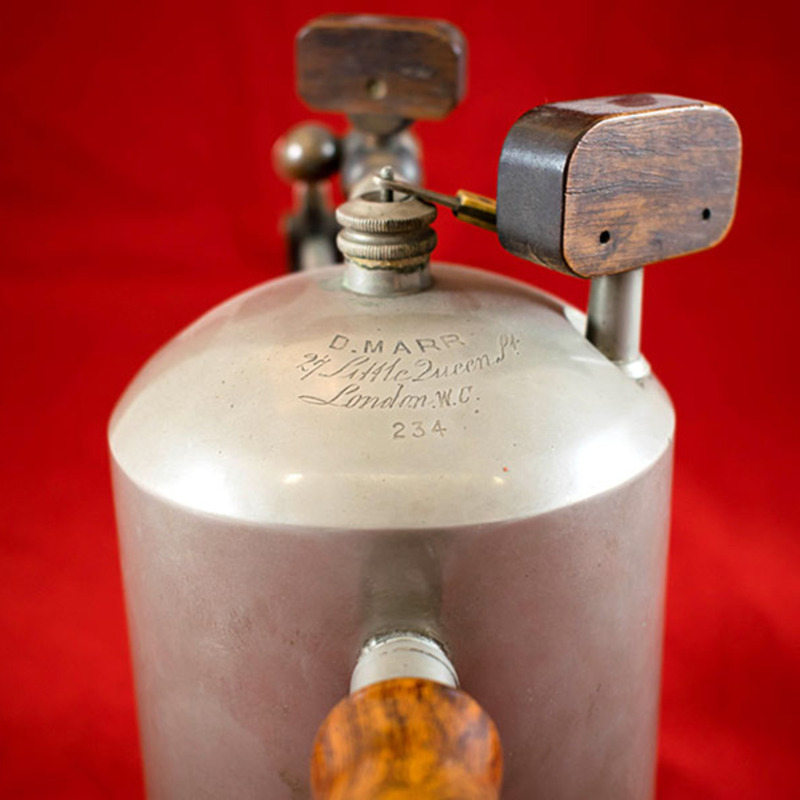 Sprays containing measures of carbolic acid were used in Lister's wards between the 1870s and the 1890s. The maker of this spray was David Marr of 27 Little Queen Street, London, who made many of Lister's instruments. 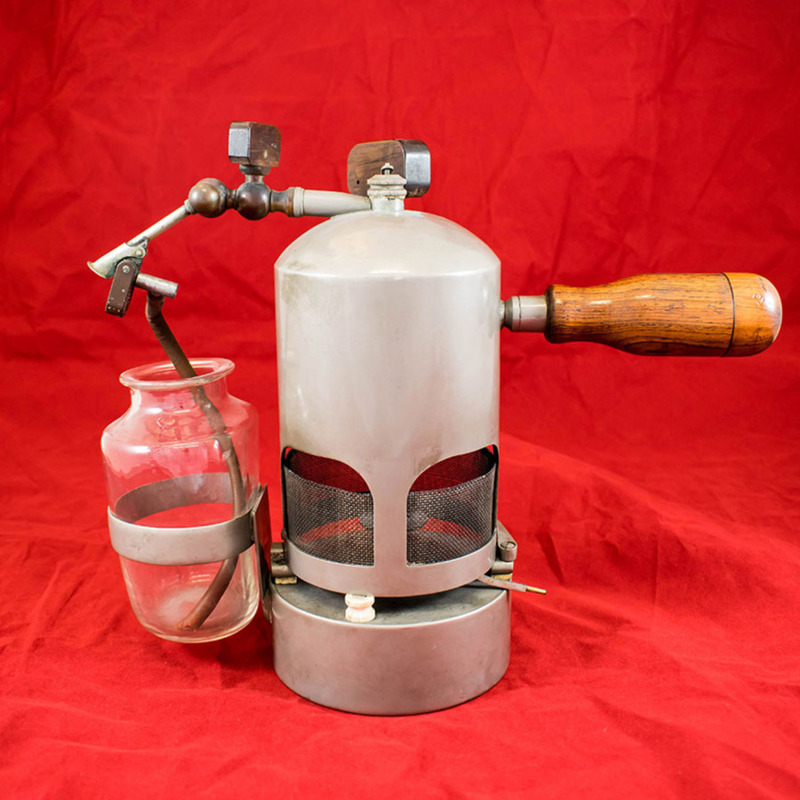 The spray has a grey metal body with a wooden handle attached at one side and a container for the carbolic acid at the other side. Water was boiled in the upper container of the main part of the spray by a spirit lamp in the lower part. The steam produced was emitted across the tube leading into the container of carbolic acid whereupon the steam mixed with the acid. Implements used by Lister for spraying underwent a steady evolution. 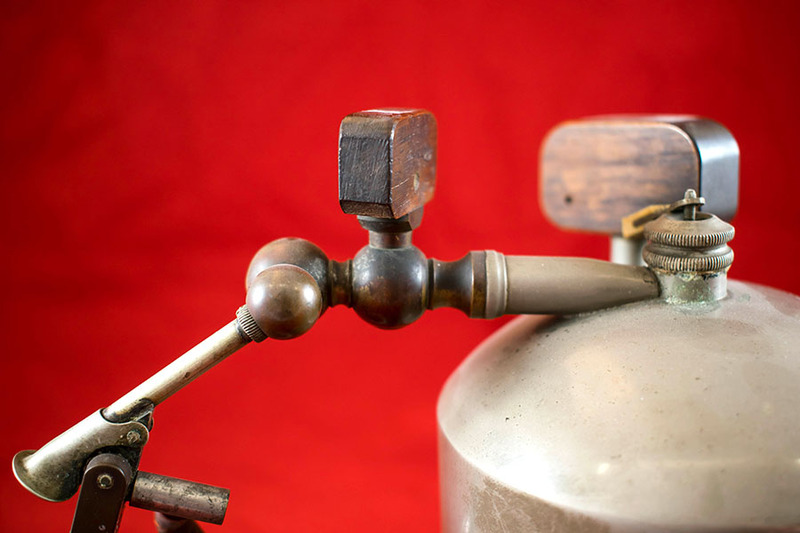 Originally an ordinary rubber bulb spray was used, this was then replaced by a large and more cumbersome machine which was mounted on a tripod and manipulated by a long pump handle. Stage three in the development process was the steam spray shown here. The carbolic acid solution used in the sprays also developed with time, the parts of acid becoming stronger. Lister was aware that the air was a medium for germs and his belief that germs could be destroyed by chemical substances was influenced by the work of Louis Pasteur. The use of the spraying technique employed by Lister was an important element of the antiseptic ritual of treatment. Lister's success with antiseptic procedures revolutionised the treatment of disease and injuries. Related Items The papers of Joseph Lister (RCPSG 11) are held in the College Archives. The College also holds a pocket case of lancets, bistouries, probes and hooks which belonged to Joseph Lister. In the Lister room within the College there is a table and a fireplace rescued from the Lister wards of the Glasgow Royal Infirmary when they were demolished in 1924. Lord Lister's graduation gown is also displayed in this room. The College's art collection includes an etching of Joseph Lister by Wilfred C. Applebey and a print of a portrait of him by T. Hamilton Crawford, as well as a picture of the scene of the demolition of the Lister wards.